The US National Center for Health Statistics (NCHS) has recently released a data brief  covering the topic of diagnosed developmental disabilities and specifically: "the latest prevalence estimates for diagnosed autism spectrum disorder, intellectual disability, and other developmental delay among children aged 3–17 years from the 2014–2016 National Health Interview Survey (NHIS)." The figures show a number of trends in relation to various diagnoses; not least that the prevalence of autism spectrum disorder (ASD) rose year on year between 2014 and 2016, albeit not significantly. In 2014, the percentage of positive responses to the question: "Has a doctor or health professional ever told you that [sample child] had Autism, Asperger’s disorder, pervasive developmental disorder, or autism spectrum disorder?" was 2.24%; in 2015 it was 2.41% and in 2016 it was 2.76%. I might add that we already knew what the 2014 data showed given other publications (see here). When it came to the categorisation of developmental disability - "A composite measure of children with a diagnosis of autism spectrum disorder, intellectual disability, or any other developmental delay" - the figures were rather more significant. So: "During 2014–2016, the prevalence of children aged 3–17 years who had ever been diagnosed with a developmental disability increased from 5.76% to 6.99%." The categorisation 'other developmental delay' seemed to be the main driver of the [statistically significant] increase in that composite measure (2014: 3.57%; 2015: 3.56%; 2016: 4.55%). There are a few additional details to mention about the report by Benjamin Zablotsky and colleagues. Boys, yet again, were the over-represented group when it came to all and total categories and race/ethnicity seemed to show some important differences such as a typically lower percentage estimate being present for most diagnoses in Hispanic children compared to other groups. What can we make of these recent statistics? 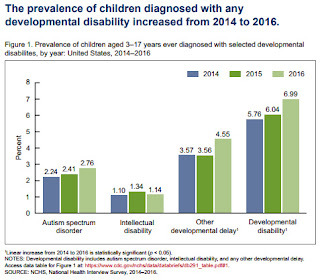 Well, it's pretty evident that, for whatever reason(s), there is still an upward trend when it comes to a diagnosis of autism and various other developmental labels. It's worthwhile pointing out that the current report used "a more restrictive definition for a developmental disability that does not include conditions such as attention-deficit/hyperactivity disorder or learning disabilities" so the figures might also not be entirely reflective of the 2014-2016 situation. I also had a question in mind about what the difference was between 'intellectual disability' (shown) and 'learning disability' (not shown) given their interchangeable meaning at least here in Blighty (see here).